Enjoy one of our popular cabins in the cool pines at Christopher Creek Cabins. Property 2: Enjoy one of our popular cabins in the cool pines at Christopher Creek Cabins. 3 Bedrooms 2 baths Luxury Cabin !!!! Property 4: 3 Bedrooms 2 baths Luxury Cabin !!!! Property 7: Welcome To 'The Cabin'. Family And Pet-Friendly. ReelParadise Cabin 3BR/ 2BA with AC, WiFi, cable - ready for your quick escape! Property 14: ReelParadise Cabin 3BR/ 2BA with AC, WiFi, cable - ready for your quick escape! Amazing Get-Away on the Creek. Enjoy the sound of Christopher Creek steps away! Property 15: Amazing Get-Away on the Creek. Enjoy the sound of Christopher Creek steps away! Property 16: THE ORIGINAL PERFECT FAMILY CABIN - SPRING SALE - LOW RATES! Property 17: Cozy Bear Cabin in Bison Ranch. Near Mongollon Rim. With a relaxing hot tub. Property 20: Heber-Overgaard 'Chavey Chalet' Cabin w/ Fire Pit! Enjoy our Cabin on the Creek! Property 22: Enjoy our Cabin on the Creek! Cozy Cabin in the White Mountains of Arizona sits on one acre of land! Property 24: Cozy Cabin in the White Mountains of Arizona sits on one acre of land! 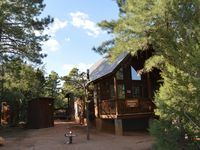 Property 28: Cozy A Frame on 1 acre beautiful ponderosa and piñon pines, and junipers. Secluded Christopher Creek Cabin with 4 full size beds in open loft. Property 29: Secluded Christopher Creek Cabin with 4 full size beds in open loft. Cabin #6 is a 2 bedroom, 1&1/2 bath, 2 - flat screen tv's. Overlooks the creek. Property 35: Cabin #6 is a 2 bedroom, 1&1/2 bath, 2 - flat screen tv's. Overlooks the creek. WHITE MOUNTAINS GETAWAY FOR THOSE HOT SUMMERS AND HOLIDAY CHEERS! Property 37: WHITE MOUNTAINS GETAWAY FOR THOSE HOT SUMMERS AND HOLIDAY CHEERS! Three Elks Cabin-Spring & Summer Deals! Book Now! Property 39: Three Elks Cabin-Spring & Summer Deals! Book Now! Property 40: Beautiful and cozy Cabin on Mogollon Rim. Located just 45 miles from Payson! A one bedroom, one bathroom cabin overlooking Christopher Creek. Property 41: A one bedroom, one bathroom cabin overlooking Christopher Creek. Property 42: Beautiful Cabin Just 2 Hours from Phoenix! Property 43: Perfect Family Cabin in the Pines - 2 Acre Yard! 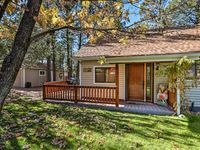 Beautiful getaway retreat in the pines! Property 45: Beautiful getaway retreat in the pines! Property 46: Heber-Overgaard Cabin w/ Deck in National Forest! My boyfriend and I wanted to get out of the city for a few days over New Years, where we could unplug, sit in the hot tub, and hopefully enjoy a snowy wintertime. We got all that plus more in this cozy cabin! The communication from pat was perfect, the house was just as pictured online, and we got some great relaxation. The only thing I would change/ask is that the heat be on when guests arrive - it was pretty darn chilly for the first few hours until the house heated up! Otherwise, fantastic place!!! !